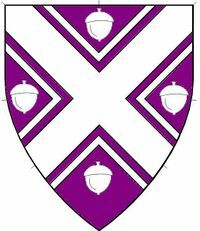 Purpure, a saltire cotised between four acorns argent. Award of Arms via King Aelfwine and Queen Arastorm 10-17-1981. 15th C. English gentlewoman originally a member of the court of Edward IV now an itinerant merchant. Now more an itinerant Viking traveler C. late 8th century . Have also served as deputy chatelaine, Barony of Endewearde 7/2009. One of several craftspeople who contributed to making trim for Prince Kenric and Princess Avelina when Endewearde made garb for them prior to their first reign. Contributed largesse to several reigns. This page was last edited on 11 April 2019, at 13:34.